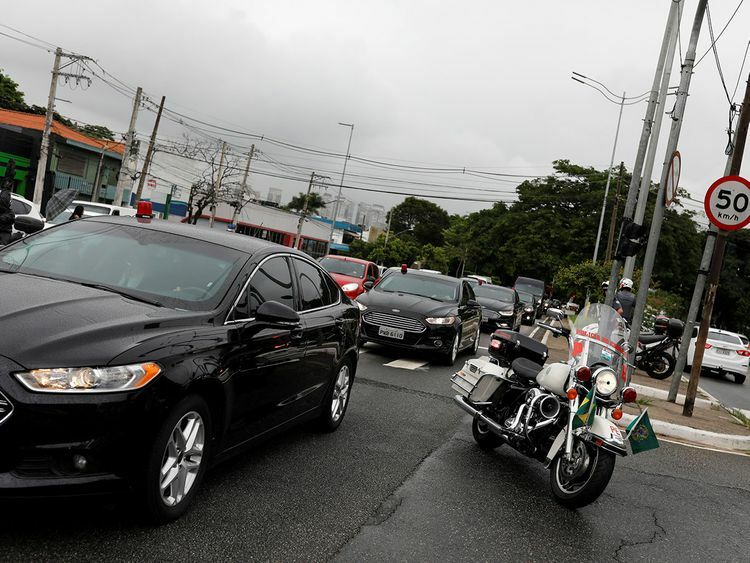 Sao Paulo: Brazil's President Jair Bolsonaro left hospital on Wednesday, ending a 17-day hiatus at the helm of Latin America's biggest economy during which several high-profile political issues were put on the backburner. Bolsonaro, 63, underwent surgery on January 28 to remove a colostomy bag and seal intestines perforated when he was stabbed by a lone assailant last September while campaigning to be president. A convoy took him from the Sao Paulo hospital where he was treated to the airport. He then took an air force plane to fly to the capital Brasilia. A photo posted by his office showed Bolsonaro smiling as he walked down a corridor with officials in tow. There was "a kind of power vacuum," Thomaz Favaro of the political risk consultancy Control Risks told AFP. The tensions exposed by the extended period of limbo reportedly including friction between Bolsonaro and his vice president, Hamilton Mourao, who very briefly served as acting leader. "Do you want to kill me?" Bolsonaro asked Mourao in a telephone call over the weekend, the latter said, though making clear the president was joking, according to multiple reports in major Brazilian media. Mourao, a retired general, was said by Brazilian political columnists to have irritated Bolsonaro's entourage - especially his sons, three of whom are also politicians - by expanding his power base and influence through meetings with congressional heavyweights and diplomats and comments to the media. The vice president particularly enraged them by publicly questioning the anti-crime justification of a decree Bolsonaro signed to ease gun ownership laws, and Bolsonaro's controversial promise to eventually move Brazil's embassy in Israel to Jerusalem. Now that he is out, Bolsonaro will have two priorities to tackle: setting out the contours of a much-anticipated reform of Brazil's unsustainable pension system - and re-imposing his authority. The Estado de Sao Paulo newspaper lamented the "administrative paralysis" caused by Bolsonaro's extended hospitalization and what it saw as his sons' undue influence. "The government today is run by someone not in sufficient health to do so, and who suffers direct and broad influence from his sons - who received no vote to be president nor occupy any ministerial posts," it said in an editorial on Tuesday. Bolsonaro won office partly by wooing investors with a pledge to overhaul of Brazil's limping, protectionist economy. That task has been largely delegated to his economy minister, Paulo Guedes, a US-trained free-marketeer. Guedes has publicly toed the line set by Bolsonaro. But reports of tensions between him and the president's chief of staff, Onyx Lorenzoni, have remained despite ostentatious pictures of the two lunching together. The reform will require changes to Brazil's constitution, to be voted by a congressional supermajority. If passed, it is expected to yield savings of up to one trillion reais ($273 billion) over a decade, according to Guedes.